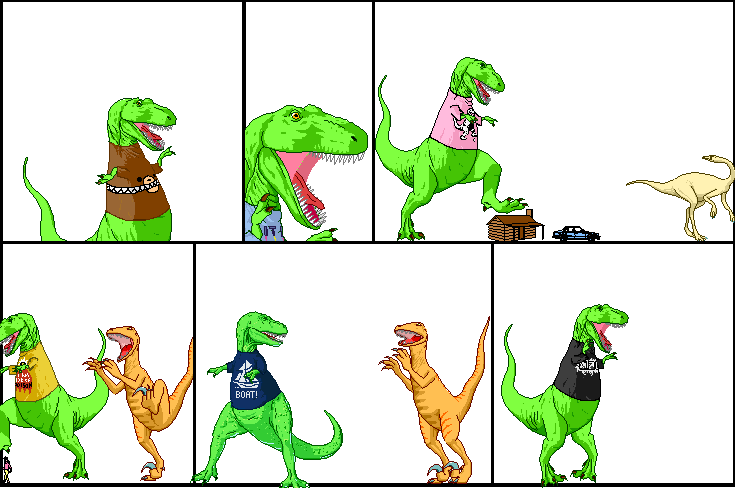 Dinosaur Comics - July 2nd, 2009 - awesome fun times! July 2nd, 2009: Hey I got a lot of footers! I don't know which one I'll take but I decided to put up each one I received, so you can get a glimpse into all our possible alternate realities! Kevin sent in bottle, Andrea sent in shore, Maxam sent in dinosaur hills, Andrew sent in suntan, Robbert sent in crazy, Niall sent in sunset, Sisco sent in beach surfing, Nathan sent in BBQ times, Dante sent in stomp island, Cat sent in sinister beach, Jared sent in surf shore, Sarah sent in raptor picnic, Mike sent in T-Rex and Utahraptor in the tropics, Becky sent in snorkel times, Cho sent in photo background, Danielle sent in bikini sunset, Alex sent in this, Brian sent in the grand canyon, Greg sent in this scifi sunset, Cunzy sent in this, Michael sent in visit to the beach, and Aaron sent in weenie roast. Okay wow! Some I can't use (they don't tile correctly) but I do really like a few of them. I may end up putting a few in rotation! For now I've gone with Danielle's bikini shot: it's fun! Thanks Danielle! I'll do this again come fall. One year ago today: before everyone emails me to mention the ketubah, i will probably mention the ketubah tomorrow! unless i change my mind! which i might! who can say!